The best time to trek to the Gokyo lake & Gokyo Peak Trek is Spring (February to May) and Autumn (September to November). The temperature is moderate in these seasons and guarantees amazing views through the trip. Although this trek can be undertaken during winter, the cold temperature might not be suitable for everyone. The Trek in Ganesh Himal region are designed to introduce you to a broad spectrum of life in different Nepalese communities and to a variety of beautiful landscapes. You can visit the Ganesh Himal base camp where there are two lakes – black and white. Twin waterfalls – Ganga and Jamuna, bring joy to your heart. you will see the red mountain flanks with the beautiful rhododendron flowers in (March and April) – the national flower of Nepal. Visit Gorkha, cradle of modern Nepal, it was the home of King Prithvi Narayan Shah, who waged many wars to unite the tiny kingdoms scattered throughout the country now known as Nepal. His palace is visible at the top of a hill in Gorkha. This region is also the homeland of warriors of Gurkha origin. The Tsum Valley is a sacred valley of Himalayan pilgrimage located in a trans-Himalayan region of Gorkha, Nepal. The knowledge of the Tsum Valley with Tibet, its natural beauty and its immaculate culture make this trek unique. Tsum comes from the Tibetan work ‘Tsombo’, which means living. On the majestic background of the Ganesh Himal, Sringi Himal and Baudha Himal ranges, this serene valley of the Himalayas is rich in ancient culture and religion. The local population is mainly of Tibetan origin and speaks a unique dialect. The trails are dotted with artistic chortens and lined with mani walls made of thousands of stone slabs carved with deities and prayers. The Tsum Valley has a long history of Buddhism. The Buddhist saint Milarepa is thought to have meditated in the caves of his mountains. Traditionally, the Tsum Valley was a culturally distinct geographic area called Tsum Tso Chuksum, which meant that thirteen provinces were governed as one territory. The ancient remains of Tsum’s kingdom are still visible today. Because of its remoteness and inaccessibility, this sacred valley and its inhabitants have been bypassed by the dominant development for centuries. As a result, the unique culture of this valley has remained intact. This trek was officially opened to tourism in 1991, but mountaineering expeditions have long had access to the region. In 1950, a group led by HW.Tilman left Thonje for Bimtang and Colonel Jimmy Roberts crossed Larkya La in search of an interesting mountain to climb. Japanese expeditions attempted each year to manipulate Manaslu (8156 m) from 1952 to 1956, the year of the first ascent. Known as the “Japanese Mountain”, much of the information about the region was available in Japanese. The Japanese continued to dominate the Manaslu climbing scene until 1971. Some hikers, including the peripatetic Hugh Swift, managed to obtain the trekking permit for the region. Otherwise, this hike has always been the domain of mountaineering expeditions. The road rises gradually until Dunche, starting point of the treks towards Langthang then joins the village of Syabru Besi. We then turn to Gatlang. The village of Galtang is a real gem. The traditional wooden houses, crowded together, teem with life and the inhabitants who wear the traditional costume, go about their occupation. Gatlang, the largest Tamang village in the region is a very special village where it is interesting and pleasant to wander. It has about 330 houses. Visit of the cheese factory. 5 hours of rough climb to the Khurpundanda Pass (3650 m). Regular and pleasant climb, between paths and roads for the first part. Then the path winds through the forest and offers, on many occasions, a magnificent view of the snowy peaks of the Langtang Himal. At certain times of the year, the arrival at the pass is done in the snow. The path becomes more difficult. The descent to Somdang on a large stone road is pleasant and allows you to progress at a good pace. Located against the mountain, the small village of Somdang (about thirty villagers) seems stuck in the valley. Beautiful day walk between Somdang and Pansan Pass Bhanjyang (3850 m): Beautiful climb in a forest of rhododendrons. Two hours of climbing are enough to reach the path that crosses hillside to the pass and offers a breathtaking view of Langtang Himal and Shishapengma! Superb crossing to reach the pass where the view is simply exceptional. The descent is fast and steep until Pansang Kharka, beautiful place of camp in full nature. The descent on Tipling is softer. The path crosses a beautiful forest whose trees are all covered with moss. Very special atmosphere. The end of the day ends with a gentle crossing in a flowering rhododendron forest (March, April). A last, steeper stretch eventually joins the village. Tipling is a scattered village with many terraced crops. The inhabitants mainly grow barley, buckwheat, potatoes, corn and wheat, which helps to ensure their self-sufficiency. The adorable traditional houses lost among the cultures offer a warm atmosphere. 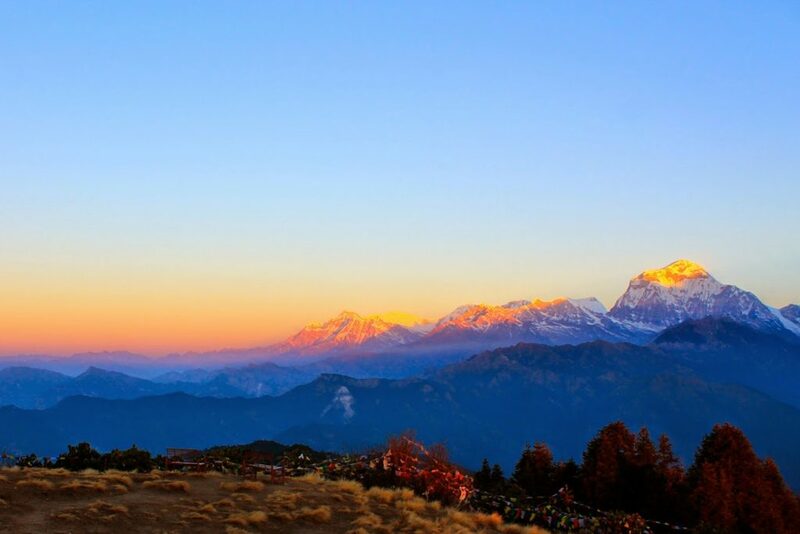 The view of the Ganesh Himal in the first light of the day remains an unforgettable memory. Crossing the extensive village of Tipling, divided into two parts rather distant from each other. The start is pleasant on a path on the hillside that crosses the villages before diving to the bridge. Arrival on Kamigaon, welcoming village with blue roofs. The descent to the bridge is quite dizzying but the climb on the other side is more progressive. Sertung: Beautiful village, very large with a school and a gompa overlooking the village (not to be missed) and offers for who wants to visit, beautiful statues to discover and especially a beautiful view of the village. Beautiful camp in the village or monastery (+ 45mn). Long descent of 2 h 30 walk to cross the borough of Borang. Mounted on a beautiful shaded stone path hung on the hill, then long crossing between terraces of the village. Lapagaon: Large traditional village crossed by a river on a wide plateau with a huge playground. Friendly and friendly village. Camp near the village. Steep and long climb on an irregular gravel road to the Mangro Bhanjyang pass (3 hrs – 2660 m) then a beautiful descent into an impressive wild forest. The forest offers a welcome freshness. A small stream with crystal clear water welcomes travelers with kindness. Superb panorama: gentle and pleasant climb in a beautiful forest towards the Myangal Bhanjyang pass (2860 m). Stunning panorama after spending all morning in the forest with incredible views of the Ganesh Himal. From the Myangal Bhanjyang Pass, a long, vertiginous and aerial descent to some places up to the bridge. Then climb steep to the village. Yarsa is a very pretty traditional village clinging to the cliff that offers no infrastructure for tourists. Great crossing with incredible views of Manaslu. Aerial path with a bird’s eye view of the valley. Some 1000m below, the Buddhi Gandaki winds rumbling at the bottom of the valley. Keronja is a large Gurung village with superb terraced crops. The cultures there are much more advanced than in the villages crossed during the rest of the trek and the terraced crops offer a delightful vision. Gradual climb along the first gorges through the village of Tatopani, place of hot springs. The path changes banks and, after a steep climb, joins the beautiful village with paved streets of Jagat. Step that starts with a path in balcony sometimes cut above the water … Crossing Philim. We cross several hamlets and huge pine forests of the Himalayas then the gorges tighten and we change shore several times to follow the course of the Burhi Gandaki. We descend to the Buddhi Gandaki which we cross before beginning the ascent and entering the Tsum Valley along the Shyar Khola. We are getting closer and closer to Ganesh Himal. From here the crossed villages are of Tibetan culture. As a reward, we finally enter the Tsum Valley in the village of Lokpa. While climbing above Chokhangparo, better to be careful of altitude problems. Walk past Lamagaon crossing rope suspension bridge to the Rachen Gompa, which is also well known as Nunnery Gompa too. We make a small visit and then we cross the Shiar Khola. Continue walking through the well managed villages Lar (micro hydro power), Phurbe and Pangdun. Leaving old historic Stupa of Bhudda in a way crossing the village of Chhule, climb upstream and cross the bridge to finally arrive at Nile. If you consider we can make your visit to a famous monastery of Chhule which is located in the top of area. Trek back through Chhule and Phurbe, on the east bank of the Shiar Khola. Finally we arrive at Burgi village. The Burgi village is a small beautiful village. Climb up to the Milarepa’s Cave Milarepa Cave (piren phu) is known for its mesmerizing glimpses of Poshyop Glacier, Kipu Himal and Churke himal. Continue trekking watching the greenery of nature and descend down to Chhokang Paro again. From their continue descending to Gho. Descending further, we arrive at the bridge over the Sarpu Khola. Trekking along the lower Tsum Valley takes you to again Chumling. After crossing the wooden bridge over Bhdhi Gandaki we fllow the path lines with houses that are interspersed with cultivated fields. At Namru there is a police chech [post again. After Namru, across the Hinan river originating from linda Glacier and continue on to Sho. Naike Peak, Manaslu North (7774m) and Manaslu (8163m) are visible from here. You will pass the stone gate and long Mani stone wall of the village after Lho with full view of Peak 29 ahead. You can make a side excursion to Pungen Glacier from here to get a very close up view of Manaslu. Follow the lateral moraine of Pungen Glacier toward Sama. From the village of Sama, it takes another 20 minutes to reach Sama Gompa for over night. We spend the day at Samagaon both for rest and acclimatization. Today, we get acquainted with the rich Sherpa culture. We enjoy the sight of thousands of mani stones with Buddhist texts and pictures and the Sherpa women clad in traditional clothes and ornaments. On a little hill near the Sama village is an old Gompa (Pungyen Gompa), a monastery with great views of the glacier. It is named after Manaslu, Pungyen means bracelet, a good description of the two peaks. It was destroyed a year after the first unsuccessful Japanese attempt to climb Manaslu. The locals believed that the climb angered the gods, and when the Japanese came back a year later they met with a lot of resistance that they had to give up their attempt. They were finally successful in 1959. This is another day set aside for proper acclimatization. There are two options for us today. The option that we highly recommend is a hike, up the valley directly at the back of the Samdo village. This hike will take us to one of the trade passes to Tibet for excellent views of Mt. Manaslu along with other Himalayan ranges including Simrang, Hiunchuli, Ngadi, Larkye Peak, Cheo and possibly Kang Guru behind the pass. En route to these viewpoints we pass many seasonal herding settlements called doksas and sight some beautiful mountain birds like the Lophophorus (the national bird of Nepal), Lammergeyer and Himalayan Griffin soaring high above us. Another option for today could be a trip to the Gya La (‘large pass’) to the north of Samdo, a more frequently used trading route to Tibet. But, this is a rather longer hike (whole day) and hence could be a little tiring. of shelter called Dharmshala, also known as Larke Phedi. The short walk today also leaves plenty of time for acclimatization and relaxing in the afternoon. 2580m. then continue to Gho, Tilje then we will be at Dhrapani. The drive from Dharapani to Kathmandu via Besi Sahar offers one an opportunity to enjoy both hill and mountain landscapes. The drive is often along the banks of the Marsyangdi and Trishuli rivers. We also drive by some beautiful villages with farming terraces on both sides of the road. In Kathmandu, we will be escorted to our hotel. The day in Kathmandu can either be spent in leisure or perhaps we catch up with some last minute shopping. To celebrate the successful completion of our journey, we will have a farewell dinner in the evening.